Grammy-winning singer-songwriter Pharrell Williams is bringing his talents to NBC’s The Voice. The 40-year-old Neptunes linchpin and recent Daft Punk collaborator (“Get Lucky”) will join the popular musical competition series before the seventh cycle begins in September. He replaces Cee Lo Green, who last month announced he was leaving the show to focus on his music. Pharrell previously served as an adviser to team Usher on Season 4 of The Voice, which aired in the second quarter of 2013. Along with Robin Thicke and T.I,, Pharrell performed the track “Blurred Lines” on The Voice last May. NBC teased the announcement earlier today, tweeting a photo depicting Pharrel’s signature Vivienne Westwood Ranger Rick hat resting atop one of the show’s iconic chairs. 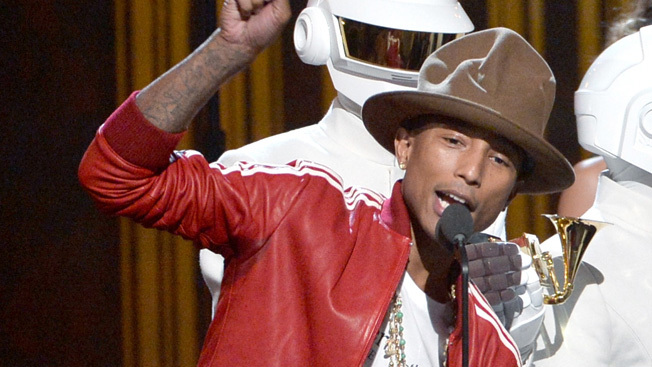 That nod to his sartorial preferences aside, Voice fans won’t actually see Pharell sporting his Grammy night lid. The sandwich chain Arby’s ponied up $44,100 for the headgear, which bears a striking resemblance to its own logo. One of the most-watched, highest-rated shows on TV, The Voice in Cycle 5 is averaging 13.8 million viewers and a 3.9 in the 18-49 demo, per Nielsen live-plus-same-day data. The fall cycle averaged 12.6 million viewers and a 3.8 rating, down 12 percent from the year-ago period. Pharrell’s most recent album, G I R L, was released on March 3. The album debuted at No. 2 on the Billboard 200 chart.